Sony Cyber-shot DSC-RX1R Review: pushing the limits? Around 16 months after the launch of the Mark IV, Sony has released the latest iteration in its RX100 series of high-end compact cameras. The Sony RX100 V features a similar 20.1Mp 1”-type BSI-CMOS sensor and the same equivalent 24-70mm f/1.8-2.8 lens as its predecessor, the Mark IV. So no changes there; instead, Sony has focused on some serious performance enhancements for the Mark V, including a new autofocus system and faster frame rate. The Sony RX100 V features a new 315-point phase-detection autofocus system that offers around 65% frame coverage, as well as face detection autofocus, which is particularly useful for shooting video. Continuous shooting has been significantly improved as well, up to a rapid 24fps (frames per second) for both RAW and JPEG files, with full autofocus and exposure tracking up to an impressive 150 shots. The Leica Q borrows heavily from the Leica rangefinder form, yet dispenses with tradition by adopting a fixed 28mm Summilux lens developed especially for a new full-frame 24-Mpix CMOS sensor, and features the highest-resolution electronic viewfinder to date. Read on to find out how well this new intriguing new addition to the lineup performs. 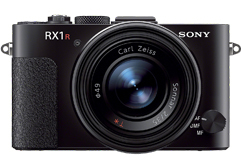 The Sony RX1R II is the successor to the popular RX1 and RX1R premium compacts. It inherits the same 35mm f2 Zeiss Sonnar lens, but features the 42-Mpix sensor of the Sony A7R II and boasts a built-in pop-up style EVF. Read on to find out how well this new update performs. DxO, the same company behind DxOMark, has introduced DxO ONE, a new pocket-sized connected camera designed to capture images with a quality and caliber previously unobtainable in a one-inch sensor camera. The DxO ONE camera’s score of up to 85 puts it on par with many DSLR cameras, such as the Nikon D7200 and the Sony A7S (both with a score of 87), and is well above such Canon DSLRs as the EOS 5D Mark III (81) and the 7D Mark II (70). This score also places it in third among compact cameras, just behind the full-frame Sony Cyber-shot DSC-RX1 and the DSC-RX1R, which score 93 and 91, respectively. Panasonic’s latest iteration of the LX series premium compact eschews the usual 1/1.7-inch sensor for the larger Micro-Four-Thirds type found the firm’s mirrorless models. It also has a Leica 24-75mm f1.7-2.8 zoom, a traditional rangefinder style top plate with EVF, a hot shoe, and manual mechanical controls. Read on to see how well this intriguing new model performs. Sony A7S Preview – A low resolution marvel for low-light & video? Sony has expanded its range of full-frame mirrorless cameras with the launch of the Sony A7S. Joining the Sony A7 and A7R, the new A7S offers a lower resolution 12.2Mp sensor with an ISO 50–409,600 sensitivity range, and breaks boundaries for video with its 4K/30p video footage output. RED Epic Dragon review: First camera to break the 100-point DxOMark sensor score barrier! The highly configurable RED Epic Dragon is the latest version of the firm’s original Epic-M Digital Still and Motion Camera (DSMC). Although we are more used to analyzing still cameras at DxOMark, we’ve had a unique opportunity to assess RAW output from a prototype using all of our usual industry standard tests. As the results were extraordinary, we thought we would share the findings. Read on to find out how this high-performance sensor performs. Leica’s latest addition to the range of APS-C X cameras adopts a 16-Mpix sensor and useful 28-70mm equivalent Vario-Elmar zoom. Read on to find out how well it performs. Street photography is an appealing genre for many photographers, and has become increasingly popular in recent years thanks to the proliferation of small high quality digital cameras and lenses. We’ve put together a concise round up of moderate wide-angle and telephoto lenses from each of the major camera systems. Read on to see which of the models we’ve chosen and what to expect from them in terms of image quality. Sony A7 review: Mirrorless marvel? As the lower pixel count of the two full-frame A series mirrorless models from the firm the Sony A7 has been somewhat overshadowed by its pricier sibling. But with a less demanding 24-Mpix sensor and on-chip phase detection AF, the A7 sounds promising for legacy glass as well as offering faster focusing with the existing E and new FE mount lenses. Read on to find out how this intriguing new model performs.